This section of the website is about ensuring the comparability of alternatives through a correct definition of the functional unit. A consequential LCA always studies a specific decision and the changes that follow from this decision. A decision can be about choosing different ways to obtain the same result (for example, going from home to work by train or in a car), or whether to perform a specific activity or not (for example whether or not to subsidise organic agriculture). Decisions always imply a choice between alternatives: alternative activities or alternative products. Which is in fact two sides of the same coin: Activities supply products; products are the outcome of activities, such as is the case with dairy farming (activity) >< milk (product). Therefore, alternatives can be modelled as product systems: interlinked activities (unit processes) that together model what happens when a product, such a car or bicycle, is produced, used and disposed of. To define a product system it is necessary to begin with a quantified description of the performance requirements that the product system fulfils. This quantified description is called the “functional unit” of the product system. The functional unit provides the reference to which all other data in the product systems are normalised. When modelling the consequences of a decision, it is the difference between the alternative product systems that we are interested in. But to be regarded as alternatives, the product systems must have comparable outputs, fulfil the same performance requirements and have the same “functional unit”. This is why it is important to ensure the correct definition of this functional unit. 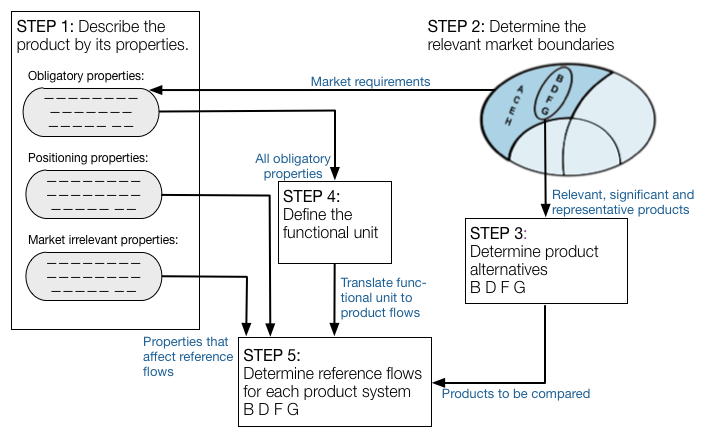 The figure below illustrates a step-wise procedure for defining the functional unit and identifying the reference flows for each alternative product system. Figure: Information flow between the different steps to identify the functional unit. In practice the product properties (step 1) may be determined at the same time as, or even from, information on the market segmentation (step 2). In other cases the product alternatives are given in advance, and thus contribute to the definition of the relevant product properties. Modified from Weidema et al. 2004. Describing product properties Product properties can be divided in three groups depending on their importance for the customer: obligatory, positioning and market-irrelevant. Determining market boundaries It is important to be precise in describing the market where the products are to be compared, in terms of space, time, and customer segments. Determining product alternatives How to determine what product alternatives to be included in the consequential LCA. Defining the functional unit How to define and quantify the functional unit of a product system. Determining reference flows How to determine the the reference flows i.e. the specific product flows for each of the product alternatives on the specific market. How to cite this: Consequential-LCA (2017). The functional unit. Last updated: 2017-05-22. www.consequential-lca.org.